America has a debt problem. That shouldn’t come as a surprise. For as long as I can remember, we’ve had a debt problem. Americans have been endlessly told that debt is good. It builds good credit, and a little debt spending can help light a fire under the economy. According to the U.S. Debt Clock, the U.S. national debt has soared to $19.98 trillion, and it’s still climbing at a frightening pace. Approximately $20 trillion is more than a little debt spending, and the current administration is ready to whip out the White House credit card and spend at a blinding pace as we invest in our infrastructure, a border wall with Mexico and a massive expansion of the Navy, while also planning to slash taxes. American household debt has skyrocketed, climbing to $12.58 trillion by the close of 2016, according to the Federal Reserve Bank of New York. It is now just $99 billion shy of the peak reached in the third quarter of 2008 — just as the financial market started to crash, leading to the Great Recession. Household debt climbed by 1.8% from the third quarter of 2016 to the fourth quarter and is up 12.8% from the low reached in the second quarter of 2013. In fact, Americans managed to shed $1.5 trillion in debt from 2008 through 2013 through foreclosures and the slow process of just paying down debt. But in less than three years, we’re right back to where we were. The key difference between the 2008 peak in household debt and the household debt that we are facing today is the composition of that debt. 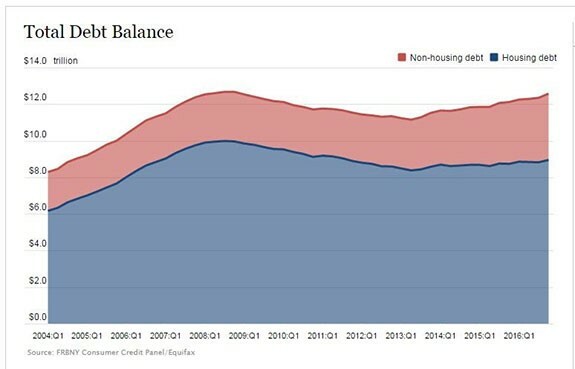 Overall, mortgage debt is down from its peak, and there has been a sharp spike in nonhousing debt such as student loans, credit card debt and auto loans. 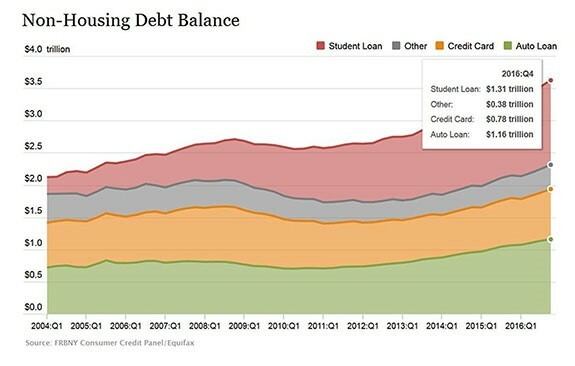 Digging deeper into the data released by the Federal Reserve Bank of New York regarding the type of debt that American households have racked up, we find that student loan debt topped $1 trillion for the first time ever in 2013 and is now sitting at $1.31 trillion. In addition, auto debt breached $1 trillion for the first time in 2015 and now sits at $1.16 trillion. One mounting concern we’re seeing is that while subprime borrowers have largely been forced out of the housing sector due to banks’ new strict lending policies, car lending is still very loose. And yes, we can play that game where we argue that subprime auto loans aren’t going to cause the same crash we saw when the housing market fell apart because we’re not looking at the same type of derivatives insanity that we saw in 2008. Too many talking heads are eager to breathe a sigh of relief that Americans’ latest debt problem isn’t centered around their mortgages — or at the very least, subprime mortgages. But they’re too quick to brush off the fact that Americans have tallied up nearly $12.6 trillion in debt. That’s no small potatoes. Debt that size is crippling. Now add in the fact that we have a Federal Reserve that is determined to lift interest rates this year at least twice … and possibly more. That means Americans are going to be paying out more in interest payments on so much of that debt, while wage growth remains slow. We’re facing a situation where Americans are going to be spending more of their money paying off that $12.6 trillion in debt or risking falling behind. And if the American consumer is spending more on debt, then he’s spending less on things like eating out, a new TV, vacations and all the great things that power the economy and make the American consumer the major supporting force behind the growth of the GDP — currently U.S. consumer spending accounts for 70% of the economy. Now you can see the precipice we’re balanced on. If the money coming into the household doesn’t increase to counter rising debt repayment demands, then spending is going to shrink … and so will the U.S. economy.